Comment from me (DoggyMom): I am particularly pleased to read in this media release that the researchers are recommending cooperation between industry, science and laypersons. As a canine massage therapist, I have found the traditional ‘evidence-based medicine’ fraternity reluctant to involve specialists in other fields and particularly those that are not research scientists or veterinarians. It is my hope that we can cooperate more in the future as we undertake research into dog health and behavior because by sharing different points of view and expertise, we develop a richer range of options in problem-solving. Genoscoper Ltd. has published in cooperation with the researchers of University of Helsinki and Pennsylvania (USA) the most comprehensive study on canine hereditary disorders so far. The research brings new information about genetic disorders causing diseases in different dog breeds. The results can be utilized both in dog breeding and veterinary diagnostics. The study was published on PLOS ONE on 15 August 2016. – We noted that surprisingly many canine inherited disorders are actually more widespread than indicated by their original discovery studies, which opens up the door for several future scientific investigations, explains senior author Dr. Hannes Lohi from the University of Helsinki canine genetics research group. – The technological potential to test a dog for multiple inherited disorders at once has existed for several years. The challenge is to harness that potential for practical use in improved veterinary disease diagnostics, sustainable breeding selections, personalized pet care, and canine genetics research, says lead author Dr. Jonas Donner of Genoscoper Laboratories. Genoscoper Ltd. is a Finnish company specialized in animal genetics and gene testing. By testing nearly 7000 dogs representing around 230 different breeds for predisposition to almost 100 genetic disorders, the research team observed that 1 in 6 dogs carried at least one of the tested disease predisposing genetic variants in their genome. Moreover, 1 in 6 of the tested genetic variants was also discovered in a dog breed in which it had not previously been reported in the scientific literature. Through clinical follow up of dogs genetically at risk, the research team was able to confirm that several disorders cause the same disease signs also in other than previously described breeds. – Precisely as we humans, every dog is likely to carry genetic predisposition for some inherited disorder, so we expect these numbers to grow as the numbers of tested disease variants, breeds, and dogs further increase, confirms Dr. Donner. – Our study demonstrates the importance of collaboration between different contributors – academics, industry and dog fanciers – to reach novel resources that not only enable better understanding of canine genetic health across breeds but also provides viable solutions to improve the health. The published study provides also an excellent example of the added value of research collaborations between academia and industry in a form that leads to a powerful innovation that start changing the everyday practice in veterinary medicine and improves the welfare of our dogs, says Lohi. The study concludes that comprehensive screening for canine inherited disorders represents an efficient and powerful diagnostic and research discovery tool that has a range of applications in veterinary care, disease research, and dog breeding. The authors emphasize that availability of complex DNA-based information is important progress for improvement of the health of purebred dogs, but it should be utilized in combination with other established approaches that promote sustainable breeding and benefit breed health. The full scientific publication can be accessed here. Donner J, Kaukonen M, Anderson H, Möller F, Kyöstilä K, Sankari S, Hytönen MK, Giger U and Lohi H. Genetic panel screening of nearly 100 mutations reveals new insights into the breed distribution of risk variants for canine hereditary disorders. PlosONE, 1(8): e0161005. doi:10.1371/journal.pone.0161005, 2016. I came across an article recently which was a sort of a “Vets Tell You What They Really Think” piece. It listed 50 things that the veterinarian would love to say, but can’t, because it would be either too forward or too unprofessional (or both). “Here’s a pet peeve: owners who don’t want to pay for diagnostic tests but then cop an attitude because you don’t know what’s wrong with the animal. Since you wouldn’t let me do the blood work or X-rays, how the heck do you expect me to know?”—A vet in South Carolina. I’m in total agreement with this vet. If we don’t have a diagnosis how are we able to help? Believe it or not, I get contacted fairly regularly from people who want me to come and work on their dog because they don’t want to pay for x-rays or other tests. In such cases, I tell them politely that I need a diagnosis to be able to confidently work with their animal. The risk is too high that, for example, if the dog has spinal injury I can make it worse rather than better. 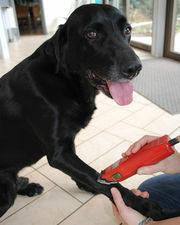 Costs for veterinary care can be high, but you pay for the skills and the tools that are available to a veterinarian. The vet is your dog’s equivalent of the Family Doctor/General Practitioner and sometimes the Emergency Room Doctor combined. Your dog needs them! There are times I’ve been caught. Such as the case where the owners said x-rays had been taken and we worked for quite a few weeks on the dog only to suffer setbacks. The owners were getting frustrated. I suggested other things within my scope of practice and I recommended they go back to the vet. That’s when I found out that the owner had only allowed the vet to take a single x-ray to save money. The x-ray didn’t reveal anything in the lower spine and so the vet assumed a partial tear of the cruciate based solely on symptoms. And that’s the diagnosis I was working with, too. When the owners returned to the vet, they were persuaded to do more scans and that’s when the problem (and a totally different diagnosis) was determined. In the end, these owners probably spent more money than they saved. And their dog walked around with an injury that was even more difficult to address. My advice to owners is to only bring a dog into your life when you are confident that you can pay for their care (and that’s means more than just vaccinations, food and flea treatments). And if you have concerns about your ability to pay for injuries and illness – get pet insurance. Some policies even cover costs of complementary care such as dog massage when these treatments are recommended by your vet. I know that some owners like the idea of setting aside money regularly; my concern is that you would have to be setting fairly large amounts aside regularly for a bank balance with compounding interest to reach into the thousands. And that’s what some of my clients face when surgeries and special procedures are needed. Your vet is an essential part of your health care team. We all need a solid diagnosis to help your dog feel better. When your dog becomes seriously ill, it’s your job as the owner to make decisions about quality of life. And it’s one of the toughest decisions we face during our lives. 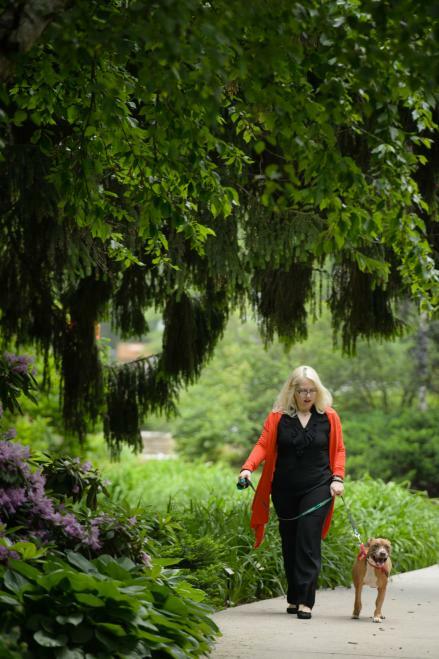 Researchers at Michigan State University are developing a new tool to help people assess their pet’s quality of life, a key factor in decisions about when to order life-prolonging procedures and when an animal’s suffering means it’s time to put them to sleep. The research team, led by veterinarian Maria Iliopoulou, created a survey to help dog owners monitor the quality of life of 29 dogs undergoing chemotherapy treatment for cancer. The owners completed the questionnaire when they received their dog’s cancer diagnosis and answered questions about how their dog was behaving then and how they behaved six months prior to the diagnosis. Similar questions were asked in questionnaires administered at three and six weeks into chemotherapy. Meanwhile, the veterinarians treating the dogs filled out shorter surveys based on their observations. The research team wanted to see if owners and clinicians agreed. The research found that there was a close match between owners and vets, particularly in questions involving play behaviour, the dog’s happiness as perceived by the owner and clinical signs of disease. These areas of commonality create the basis for a tool that will help to facilitate client and vet communication. If there’s agreement about what constitutes quality of life, then it is these criteria that owners and vets should use to help agree on next steps for the dog’s care. The research team has published their results in the Journal of the American Veterinary Medical Association. All dogs were patients at the Michigan State University Animal Cancer Care Clinic. The plan is to expand the work using a much larger sample size of patients and Iliopoulou hopes to develop questionnaires for dogs suffering from other diseases as well. Since I’m not a vet, I’m not qualified to diagnose injuries but this particular one sounded to me like a ‘classic’ cruciate ligament tear or rupture. My friend didn’t want to pay after-hours vet prices on the weekend if he didn’t have to but equally didn’t want to wait to see a vet if her condition was serious or life-threatening. I suggested that he rest Lea, keep her warm, dry and comfortable and go to the vet if there was an immediate change in her condition. Otherwise, if she still wasn’t weight-bearing on Monday, then a visit to their regular vet was warranted. As it turned out, Lea’s condition didn’t change over the weekend and a visit to the vet confirmed a cruciate ligament tear. She’s now resting in the hope that the tear will heal itself. In many cases, cruciate ligament injuries are partial tears and surgery isn’t required. In others, full rupture of the ligament may mean that surgical repair is required. Some dogs still need ongoing support for their legs regardless of whether the ligament was repaired surgically or not. Leg braces that are made from a cast of the dog’s leg work well in many cases. I work on dogs with these injuries in my canine massage practice. Laser therapy helps to relieve the pain of the injury and support healing. Passive range of motion exercises assist in keeping the leg joints mobile, but without pressure on the knee joint. And hydrotherapy works wonders when the dog is ready for this type of more strenuous (but non-weight bearing) exercise! Here’s a great video, courtesy of the folks at Vetstoria and YouTube about the symptoms and diagnosis of cruciate ligament ruptures.